Although Gangtok Hill town is quite small, there are numerous options here for night outs including pubs, bars, casinos, music and night clubs. You will be surprised to know that the first land-based live casino in India was set up in Gangtok and it was followed by more casinos here. 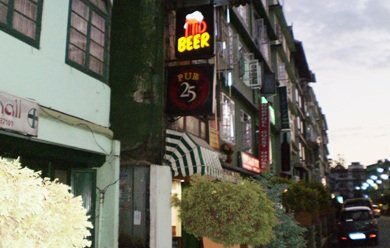 When it comes to bars, about 80% of the restaurants in Gangtok have bar services. Below I am mentioning the ones that are exclusively designed as bars, pubs, nightclubs or casinos. 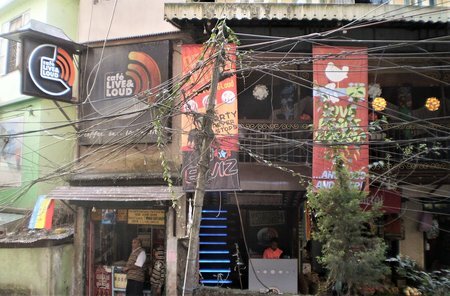 When you walk down Tibet road during the day time and look at the building where this music club is located, you won't believe your eyes. It's almost hidden behind awful mesh of overhead electrical wires. I said to myself, this can't be the place. But when it gets dark, the lights of the cafe come on and the wires get somewhat invisible, then you start thinking of stepping in. At least that's how I stepped in for the first time. It's about 7-8 minutes uphill walk from MG Road. The fluorescent steps of the stairway lead to club upstairs. This is the first acoustically designed live music club in the whole of north east India and guess what, the only one. As you walk in, on the right is a lounge area, more like a large converted veranda with roof cover and overlooking the Tibet road. This is a great place to relax during the day time, have coffee, use the wi-fi and watch the activities on Tibet road. It's also a great place to have your breakfast. There is a dedicated coffee counter in this section and a cigar station. The lounge area can seat about 50 persons. The section on the left is the main concert area which has a capacity of 100. This is the place which comes live & loud at night with well known bands playing music of all sorts and people enjoying drinks and dancing away till mid night. Located at the New Market area of MG Marg, PUB 25 is a great place to chill, drink, listen to some good music and have good food at reasonable prices. In fact drinks are cheaper than several other places in the area. It's a traditional British style pub with excellent interior decors and ambience, and spread across two floors. The bar is well stocked. They serve great varieties of cocktails as well. 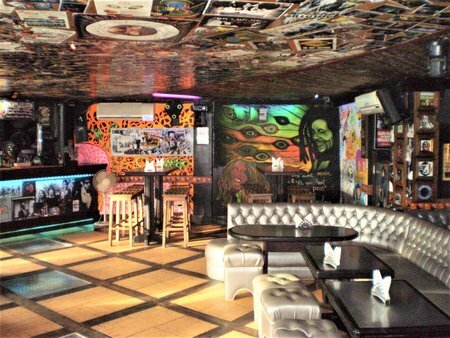 X'cape is the most popular nightclub in Gangtok and located at the Vajra Cinema Hall. Great music and dance floor combined with great selections of wine & spirits plus good food. You will mostly find Gangtok's young crowd here. It's open from 7pm until mid night. Phone: +91-3592-229887. Another nightclub which is relatively new but popular is Club King B below Mayur Hotel. They have Ladies Special on Fridays. The Sunday Jam session starts from 2pm. Raring to spend a night in Gangtok with Casino gaming like Roulette, Bacarrat, Flush, Blackjack and electronic slot machines? You won't be disappointed. Casino Sikkim located at The Royal Plaza hotel is the first live casino set up on land in the whole of India. It's open from 6pm to 4am. Another great Casino is located at the Mayfair Spa & Resorts, about 10kms from Gangtok town. The entry fee here includes limited free drinks, set food and limited complimentary playing chips. It's open 24 hours. At the time of writing this article, the entry fee to this casino was Rs. 3,000 per person which included 3 pegs of drinks, set meals, and playing chips worth Rs. 2500... not a bad deal though. Mayfair, Lower Samdur Block, Ranipool 737 135, Gangtok.